To connect the flywheel(s) to the road wheels, an infinitely variable transmission is required. This can be in the form of an electric motor/generator embedded in the flywheel rotor and connected to a traction motor in the drivetrain, as revealed in our 1994 U.S. patent. This is sometimes described as a 'flywheel battery'. Alternatively, an all-mechanical solution can be used, as we revealed in 2006. The all-mechanical approach offers advantages in terms of efficiency and cost, until the requirement to support a plug-in battery to provide extensive engine-off range is introduced. The solution shown below, and patented in 2003, then becomes the optimum. 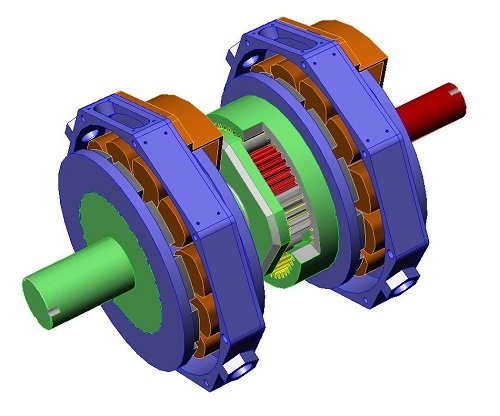 It consists of a planetary gear set with the rotor of one motor/generator connected to the ring gear and the other motor/generator connected to the low-speed shaft, shown in green. The sun gear is connected to high-speed shaft, shown in red, which is connected to the flywheel(s). The ring gear is shown cut away, to reveal one of the planet gears and the sun gear. As battery costs fall, the marginal cost of turning a fuel-only hybrid into a plug-in hybrid will fall. In Europe, with its high fuel taxes, plug-in hybrids will soon become the norm, followed later by other regions as fuel costs rise. Consequently it is our view that the electro-mechanical solution is already the optimum for models offering the option of fuel-only or plug-in. Clearly, it is also optimal for fuel cell and battery-only applications.